White paper copy/printer paper will work! Cover the 4-inch cardboard tube with white paper using a glue stick. Use tweezers to poke two holes in the cardboard tube about 1/2-inch apart. This is where the legs will go. Bend an orange pipe cleaner in half and insert one into the holes from the inside of the tube. Bend the bottom of each end of the orange pipe cleaner to make the foot, about 1-inch long. Bend the legs and set aside. Twist the two white pipe cleaners together to make one thicker pipe cleaner. Use tweezers to poke a hole in the top of the tube (for the neck, so opposite side from the legs). Insert the thick white pipe cleaner into the hole and bend in place from the inside of the tube. Starting at the top of the white pipe cleaner, wrap the pipe cleaner around the end of your tweezers to create a tight coil (the head). Cut a 4-inch piece from the remaining orange pipe cleaner and tuck it into the coiled white pipe cleaner. Grab your glue and add a dab or two to each of the following areas: beak, neck where it enters the tube, and legs where they enter the tube. Glue on googly eyes to each side of the head and glue white feathers to both sides of the tube. Glue a feather coming out the back of the tube as the tail. 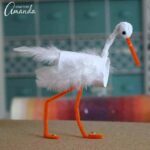 This project for Cardboard Tube Stork was printed from CraftsbyAmanda.com - https://craftsbyamanda.com/cardboard-tube-stork/ and can only be printed for education or personal use.